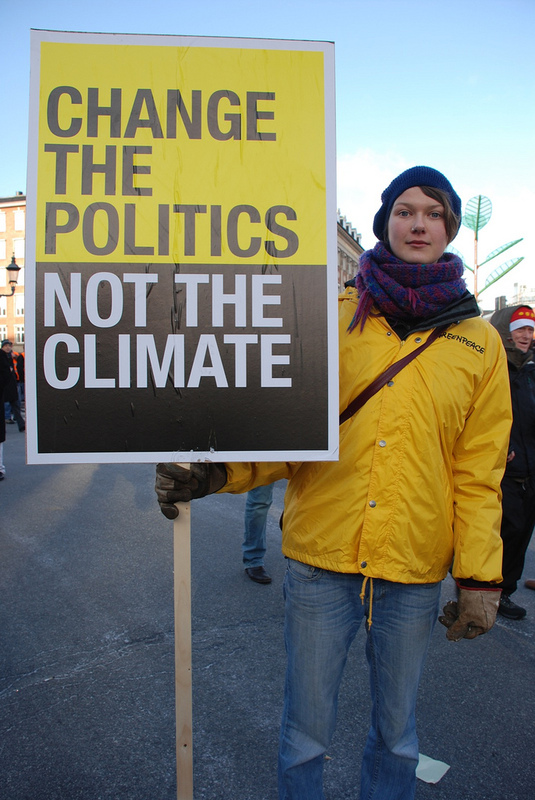 Change the politics, not the climate! "Earlier this year, Bono and I spoke about the intersection between the extreme poverty in the developing world - especially in Africa - and the climate crisis. It is impossible to solve one of these issues without dealing with the other (Gore, 2008)". So if we are to solve the equality in the world, our uneven development and environmental problems we just can't work on one of them. They are all connected and thus we have to deal with all of them at once. Could we really call today's capitalist system based on a never-ending and unsustainable consumption as development? Why does one count the consumption of our nature as an income, as something free to use whenever and how we feel for it? The current global development is uneven, lacks equality and comes with a heavy environmental price. And as we today face a climate and ecological crisis beyond our wildest dreams we can see that the crisis and our problems have roots not just in our modern industrial and fossil burning society, but also in ancient Rome and in our colonial history. You know how the old saying goes: "it was better before". But was it? Just as John Bellamy Foster writes in The Vulnerable Planet "many of our fundamental ecological problems date back to preindustrial times." The early civilizations were largely made up of agriculture economies and so they were vulnerable to ecological collapse from the degradation of soil. The Sumerian, Indus valley, Greek, Phoenician, Mayan and Roman societies all failed, as historical and archaeological evidence shows, in part to ecological factors (Foster, 1999: 36-37). The Romans made huge impacts on their surrounding environment, which can still be seen today. Examples are deforestation, depletion of natural resources, loss of wildlife and pollution from cities and industries. Abandoned olive presses from the Roman Empire can be found in North Africa - where once trees and olives flourished there is now just deserts. The Roman smelting industries polluted the surrounding environments and poisoned its workers with lead, mercury and arsenic. Studies of the Greenland ice cap even show dramatic increases of lead in the atmosphere during the Roman era. Donald Hughes notes in Rethinking Environmental History, that the awful health and environmental conditions must have "favoured" the plague and helped it spread across the Mediterranean (Hughes, 2007: 27, 33, 35-37). The collapse of the old civilizations can be seen as examples of what is happening today. You can think of the current world as a bigger and more advanced version of the Roman or Mayan empires. The environmental problems we face today is a mixture of old and new problems such as toxic and radioactive waste into waterways, deforestation in light of increased palm oil farming, dead seabed's due to increased discharge of nutrients like nitrogen and phosphorous, species extinction on a much larger scale etc. Instead of just destroying local areas of the planet we are now in the business of global destruction. The early civilizations lacked proper understanding of economic and environmental policies, but we have that knowledge. And as our future is decided on our actions in the past we must not follow in the same direction as older and failed civilizations have. I wouldn't blame technology for our ecological problems. And I don't believe that if we reject our modern world we can reach ecological harmony. The root to our problem lies in our social systems, and so we need to basically reformulate and reorganize our society in order for a more sustainable and ecological friendly world to emerge (Foster, 1999: 35-36). Economies and development are in the end "constrained by ecological conditions". As deforestation, "agriculture intensification" and other environmental problems contributed to the fall of the Roman and Greek civilizations even the people in ancient Rome made this connection (Hughes, 2007: 4, 12). But something that earlier was confined to more local areas of the world have due to globalization become global problems. As Clive Ponting shows, the uneven development and global problems we face today comes from our colonial history and the rise of Europe, which "drastically affected a whole range of ecosystems" and "reshaped the relationships between different regions" (Ponting, 1991: 194). The rise and expansion of Europe created, what we today call the Third World or Global South, and literally forced the world into a single system and world economy dominated by the "North". European powers such as Portugal, Spain and Great Britain created colonies and plantations around the world so that they could grow crops for their "luxury market" and for industrial needs during the 15th and the 18th century. These were crops, such as sugar cane and tobacco, which for some reason could not be grown in Europe. This was either because the climate was not suitable or they missed cheap labour, mainly in form of slaves, convicts or indentured servants (Ponting, 1991: 194-195, 198 also Foster 1999). The territories under colonial ruling, in the Canary Islands, Cuba, Peru, Australia, Brazil, Hawaii etc, were exploited and used just to benefit the home economy. The crops were only a selected few and were mainly grown on huge plantations owned and managed by Europeans which took up the best lands and displaced local farmers to smaller and less fertile grounds. The Europeans in control was only a tiny fraction of the total population and wanted others to do the manual work as they regarded the job done on the plantations as "degrading". These "others" were usually slaves from places like Africa (Ponting, 1991: 196). When slavery later was abolished in the 19th century the colonial powers used cheap indentured labour from countries such as India and China (Ponting, 1991: 196, 199). Different laws and taxes were also introduced by the Europeans, such as the agrarian land law introduced in Indonesia by the Dutch in 1870, which gave them complete control of all unused land (Ponting, 1991: 201), and the British hut and poll taxes in East Africa (Ponting, 1991: 203). These different taxes and laws resulted in that the local farmers had to work and grow the colonials "cash crops" to earn money. Or it created a similar "peculiar mixed system that was neither a true plantation nor a smallholding" where the farmers growing the crop "were neither slaves, as on islands such as Jamaica, nor landless labours as in Puerto Rico" but still forced to grow an particular crop for the Europeans (Ponting, 1991: 201). Also, import duties were introduced to pay for the costs for goods to Africans, but goods intended for the European farmers in Africa where exempted. By 1930 the African economy had been transformed and integrated into the international economy controlled by the white Europeans and increasingly the Americans (Ponting, 1991: 204). Even after the countries previously under colonial rule achieved political independence and sovereignty not much changed. They were, and still are, under the influence of the Western world, their former colonial rulers. The plantations are still there and a majority of them still produced one single crop or resource. But now they were managed by large multinational corporations and companies such as the Firestone Rubber Company, who owned a 127,000 acres large plantation in Liberia, and the United Fruit Company (Ponting, 1991: 206, 212). It did not matter if the companies were disposed of the land and plantations they previously had owned or by being nationalised. The multinational corporations still dominated the processing and manufacturing of the raw commodities. And due to the overwhelming financial and economic powers the western countries had gained the trade was still in their favour. For example, the companies leave out many of the countries from the more profitable parts by not building any smelters or processing plants. Instead they export the raw commodities to their own home market where the final product can be worth many times more when it's been refined. Another example is that the "North" around mid-1950 put a tax on already processed timber which meant that the Third World countries must export wood that hasn't been processed and then import back value-added boards and papers (Ponting, 1991: 214, 216, 218). In the beginning of the twentieth century Europe and the US had managed to transform former self-sufficient countries in the Third World to countries where the development took the form of providing raw resources and growing a selected few crops, or in some cases just a single crop, for other countries. In one word: monoculture. This in turn brought with it environmental damages to the soil, deforestation and a loss of biodiversity as the crop growing was produced over huge areas. Every year the production of export crops from the Third World grew by three-and-a-half percent while the actual food production for the home market grew much slower than the actual rise in population. This meant that the countries had to import a majority of the food needed. Cuba, Fiji and Tahiti are good examples of this. By 1950 the growing of sugar crops took up 60% of all farmland and consisted of up to 75% of the countries export in Cuba. Because of this Cuba had to import over half of its food. In Fiji during the early 1980's the sugar was over 80% of all exports while it only employed 20% of the population. And in Tahiti during the 1950's 75% of the farmland was used to grow crops that were only meant for export (Ponting, 1991: 212-214). James O'Connor argues that the "uncontrolled expansion of monoculture" in Third World countries is the result of uneven development. Brazil and sugar production in the 16th and 17th century, as an example, pushed the country into "deep poverty", which it has never really recovered from. An example of the devastating effects on the environment uneven development "under the aegis of colonialism and of mindless economic expansion", as O'Connor puts it, has brought forth was the vast deforestation around the world during the 19th and 20th century (O'Connor, 1989: 4-5). It is worth noting that Japan was never colonized by the "North" and thus the country was able to be ranked among the other advanced capitalistic states by 1890 (Foster, 1999: 89, 91). So the former colonial powers have created a world and economic system where the countries in the Third World are bound and intertwined to supply the "North" with crops and other raw commodities (Tabb, 2007: 33). Twenty percent of the total food grown in the world goes from the Third World to the developed and industrialised countries while only 12% goes in the opposite direction. The "South" still exports more food than it imports, even during major periods of hunger and starvation. For example in the famine of 1876-1877 in India wheat was still being exported to the Great Britain (Ponting, 1991: 214). Ponting says that the "North" became developed and received their high material and living standard on the expense of the poor people in the Third World via economic and environmental exploitation with poverty and human suffering as a result (Ponting, 1991: 222-223). O'Connor says that the worst environmental and human disasters "as a rule occur in the Third World" and that the victims "are typically the rural poor", but also the "oppressed minorities and poor in the First World", i.e. the West (O'Connor, 1989: 2).And when it comes to climate change it is, unfortunately, the ones that are the least responsible for the climate crisis, primarily the poor people in the Third World, who are the most vulnerable and will be affected the worst from the devastating effects a changing climate will bring (McMichael, 2008: 15). After the former colonial rulers had left during the end of the 18th and early 19th century and the countries gained independence they did not just face economical or environmental problems but also more deadly ones such as genocides and wars over resources. The norm for many new countries and their leaders after they had gained independence was complete control of the army and the power to intimidate and bully its own people. An example of this is Rwanda. There the Belgians had ruled the country by giving the native minority of Tutsi chief's superior status and control over the Hutus, a large native group in the country. After the Belgians left the country in 1962 Tutsi dictators were left to rule, which in turn led to the killing of hundreds of thousands of people in the Rwandan genocide in 1994 (Tabb, 2007: 33). William K. Tabb argues that these dictators and other ruthless leaders are fuelled by easily extracted resources and that this resource extraction still in today's world continues to "spur extremes of violence and war". A study by Jeffrey Sachs and Andrew Warner in 1997 shows that the higher a country depends on the export of their natural resources slows down the countries growth and that it "significantly and substantially increases the risk of conflict" and civil wars (quoted in Tabb, 2007: 33). And here is where the oil comes in. In today's world traditional wars where you normally fight for a specific land area are very rare. Instead civil wars over resources have become the standard. Countries rich on oil such as Nigeria, Gabon, Sudan, Congo and Chad have a long history of military dictatorship and coups which have resulted in starvation, diseases and the death of millions of people and the destruction of the local environment. In Angola, for example, millions of people have died in the civil war that was started because of the "wholesale looting" of the countries oil reserve and natural recourses (Tabb, 2007: 34-35). The huge sums of money generated from the valuable resources was sent to banks overseas and almost never found its way to the people of Angola. Today imperialism has taken the form of global organisations such as the World Bank, IMF and the WTO. And as Tabb points out that in these troubled areas where you can find precious resources you will find foreign corporations and the World Bank ready to work with the local leaders for their share of the cut. Global Witness reports that even though Congo Brazzaville is the fourth largest oil producer in Africa it has a debt of over $6.4 billion. This huge debt is a consequence of the "influence peddling and bribery" of the former French state company Elf Aquitaine (cited in Tabb, 2007: 34-35, 40). In the past countries and their governments would be directly involved in these troubled areas. But today they have to some extent been replaced by global organisations and corporations. When it comes to the Iraq war and occupation many corporations and organisations besides the US army is involved. One example is Blackwater Worldwide, a private military company which has played a substantial role as a contractor for the US government in Iraq. As peak oil (also called Hubbert's peak) comes closer and world oil demands and prices soar - the demand grew by 1.5% in 2002, 1.9% in 2003 and 3.7% in 2004 (Tabb, 2007: 39) - the former "Anglo-American petroleum dominance" in the world is loosing ground to state-controlled producers such as Kuwait Petroleum, Abu Dhabi National Oil, Saudi Aramco and Sonatrach, but also from Western oil producers such as StatoilHydro. These state-controlled companies holds "at least half of the world's proven" reserves and a quarter of current oil production. Instead of investing into alternative and renewable energy sources to combat the high energy costs and becoming energy independent USA and Great Britain have panicked and is using "force to reassert dominance" via "state terror and coercion" in Afghanistan and Iraq. Unfortunately these occupations and resource wars have failed and instead of creating stable governments it has resulted in more terrorism, the alienation of the rest of the world and an increasing cost of oil (Tabb, 2007: 38-40). But it is not just in the Middle East there is an energy struggle going on. Latin America currently supplies more oil to the US than the Middle East does (Davis, 2004: 2). And Third World countries such as Venezuela and Bolivia, both oil rich nations, have in recent years tried to stand up against the North's energy and political influence. Venezuela and its democratically elected leader Hugo Chavez has increased the nations stake in major energy projects from 40% to 60% in the countries oil company Petroleos de Venezuela. Norway's share in StatoilHydro is for example about 62% (Wikipedia.org). And instead of going the same path as Congo Brazzaville, Hugo Chavez has used the money generated from his country's oil to raise his people's living standard. The President of Bolivia, Evo Morales have nationalised the countries energy industry, similar to what is happening in Venezuela. For this Evo Morales have gained support back home with an approval rating of 80%. This can be compared to George Bush's own 33% approval rating back home in USA. For this, both Morales and Chavez have been criticized by the "North" for their "weak commitment to democracy" (Tabb, 2007: 39-40). In Columbia leftwing ELN guerrillas are threatening the oilfields and pipelines operated by the US-based company Occidental Petroleum. That is why Special Forces, the CIA and private security contractors from the US is currently involved in an "an ongoing reign of terror" called "Operation Red Moon" in the Arauca province. T. Christian Miller, reporting in the Los Angeles Times, says that the consequence has been that "mass arrests of politicians and union leaders have become common. Refugees fleeing combat have streamed into local cities. And killings have soared as right-wing paramilitaries have targeted leftwing critics" (quoted in Davis, 2004: 2). And in the Straits of Malacca, a narrow passage of East Asia's oil supply, the Malaysian foreign minister have complained that USA is "exaggerating the threat of terrorist piracy" to justify deploying military forces there (Davis, 2004: 2). Because our development and "global market infrastructure" is based almost solely on the burning of fossil fuels, such as oil and coal, the earth is warming up and our climate is changing. And as we stand in front of the biggest environmental crisis ever, namely man-made climate change, our efforts on slowing down the devastating effects can scuttle because of our worlds uneven development. "Gaia, the living Earth, is old and not as strong as she was two billion years ago. She struggles to keep the Earth cool enough for her myriad forms of life against the ineluctable increase of the sun's heat. But to add to her difficulties, one of those forms of life, humans, disputatious tribal animals with dreams of conquest even of other planets, has tried to rule the Earth for their own benefit alone. With breathtaking insolence they have taken the stores of carbon that Gaia buried to keep oxygen at its proper level and burnt them. In so doing they have usurped Gaia's authority and thwarted her obligation to keep the planet fit for life; they thought only of their own comfort and convenience. (quoted in Lovelock, 2006: 146)"
Gore says that our "overdependence" on fossil fuels and our weak policies on climate change show what can happen "when reason is replaced by the influence of wealth and power" (Gore, 2007: 191). Since the "market" has become one with development, McMichael argues, we have responded to this climate crisis by framing "solutions to climate change in market terms". This, McMichael warns, results in "commodification of the ecological commons through green market solutions such as carbon trading, emission offsets, and biofuels, to sustain, rather than question, current trajectories of accumulation and consumption". McMichael says that because the world is already now warming up much faster than what the IPCC's "conservative" numbers estimated and that the world's resources are finite and "deeply unequal", the idea of the green growth is an "oxymoron". McMichael argues that the fog of "promises of market prosperity" has covered the effects and impacts of development on our climate, "let alone be recognized for the catastrophe that it already is", warning that it "will remain so long as market solutions prevail". The world is slowly realising this. The 2007/2008 Human Development Report says that "climate change is the defining human development issue of our generation". And the eight Conference of Parties (COP8) of the UNFCCC in Dehli declared that "climate change is a serious risk to poverty reduction and threatens to undo decades of development efforts" (McMichael, 2008: 1-2). When it comes to responsibility for the current climate crisis the world is just as uneven and unequal. The "North", i.e. the West, is responsible for about 80% of the worlds CO2 increase. An average person living in Great Britain will in only 11 days emit as much CO2 as an average person in Bangladesh will during a whole year. And just a single power plant in West Yorkshire in Great Britain will produce more CO2 every year than all the 139 million people combined living in Uganda, Kenya, Tanzania, Malawi, Zambia and Mozambique (McMichael, 2008: 2). But still, in light of these unequal differences USA demands that they won't lower their emissions before the Third World countries does. And this is exactly why the current climate talks aren't getting anywhere. The old colonial past and today's imperialism in the shape of the World Bank, IMF and the WTO (Tabb, 2007: 40) has created a rift between the "North" and the "South" and their relationships today. Or as George Monbiot puts it: "Rich countries once used gunboats to seize food. Now they use trade deals" (The Guardian, Tuesday August 26 2008). This rift takes the form in expression of criticisms such as the comment from the Argentinean President Kirchner who said that "the North should meet its "˜environmental debts' just as it demands the "South" meet its "˜financial debts'". Or Brazil's President Lula who said in February 2007 that "the wealthy countries are very smart, approving protocols, holding big speeches on the need to avoid deforestation, but they already deforested everything" (Philip McMichael, 2008: 3-4). You can say that the "de-localization" of crop growing to countries in the Third World with low wages and a weak environmental system was done to conserve the environment in Europe (McMichael, 2005: 284). An example of how the "North" has been able to get away easily from their climate and ecological responsibilities is Kyoto's Clean Development Mechanism (CDM), a part of something that Philip McMichael calls "market environmentalism". CDM encourages Western countries to meet their very own reduction targets, not by reducing their CO2 emitting sources back home, but by investing in cheap solutions in the "South" (McMichael, 2008: 6, 16). The European Union agreed on a new climate deal during the end days of the 2008 United Nations Climate Change Conference in PoznaÅ„, which was held during December 1-12. The EU promised that they will cut their emissions with 20% by 2020. But the actual emission cuts could end up being as little as 4% by 2020 (Black, BBC News, 2008). That is because of special exemptions for dirty industries in Europe as well as allowing cheap emission cuts overseas to be counted to the EU total (WWF, 2008). These emission cuts done overseas will make it easier for us in the "North" to reduce "˜our' emissions but harder for the developing countries in the "South" to reduce theirs. Monbiot calls this "carbon colonialism, in which Europe picks the low-hanging fruit in developing countries, leaving them with much tougher choices later on" (The Guardian, Friday 12 December 2008). "when powerful states disregard weaker states' position in the international division of labor in areas where they possess structural power, they run a high risk of weaker states "˜reciprocating' in policy areas where they possess more bargaining leverage. The issue of global climate change - which itself is characterized by tremendous inequality in vulnerability, responsibility, and mitigation - can therefore not be viewed, analyzed, or responded to in isolation from the larger crisis of global inequality." Robert and Parks also list three points from where this "rift" and "mistrust" comes from: 1) Wasteful Western consumption, 2) A state's ability for environmental reforms is a function of the state's position in the international scene of labour, and 3) The West's approach to more sustainable and environmental issues will hinder the "South" from their economic development. John Rapley argues that we in the West must "probably have to bear the expense of environmental adjustment", because if we don't the countries in the Third World will continue to take advantage of cheap and CO2 polluting technologies. If we don't manage to get away from this rift between "North" and "South", developed and underdeveloped, we will never be able to agree on any lasting climate policies that will be powerful enough to combat climate change and its devastating effects (McMichael, 2008: 3-5). What development and for whom? In the beginning I asked if we really could call our current capitalistic system for development. But, what should be developed and for whom? McMichael lists two different forms of development: food security through the global market, and its alternative: food sovereignty. The privatization of food security through the global market was constructed in 1986-1994 during the Uruguay Round, a forerunner to the WTO's agreement on Agriculture in 1995. This agreement means that nations no longer have the right to independent and sustainable food within its borders. Instead of letting the producers and consumers manage and decide over the food system it puts corporations and the demands of the global market in control of it. McMichael calls this the corporate food regime, and says that the only benefactors of this "political construct" are about 15% the world's population. Food sovereignty is an alternative way to reach food security. The concept of this idea was put forward by Via Campesina, an international movement of mainly farmers, during the World Food Summit in 1996. Simply put: food sovereignty lets people and nations decide and define their own food and agriculture production. Food sovereignty does not rule out trade, instead it creates a more sustainable and self reliant trade between nations (McMichael, 2004: 277-278 and McMichael, 2005: 269-270, 281, 290-291). As we know, capitalism is all about profit. The higher the profit is, the higher the growth rate will in theory be, which in turn leads to a higher rate of depletion of various recourses which ultimately leads to a higher rate of pollution (O'Connor, 1989: 11). At the end of capitalism there is environmental destruction. "When we should have been planning switches to smaller, more fuel-efficient, lighter cars in the late 1960s in response to a growing demand in the marketplace, GM management refused because "˜we make more money on big cars' "(quoted in Foster, 1999: 124). And with help from the US government, Standard Oil and Firestone Tire these auto companies deliberately dismantled earlier mass transportation system in the US during the 1930s to the 1950s. During most of the twentieth century the US government decreased funding for public transportation while they wastefully poured money into highways in an effort to increase the corporate profits that comes with private motoring. While this was happening the auto companies bought up electric streetcar lines and converted them to busses. This is today known as "the Great American streetcar scandal", "General Motors streetcar conspiracy" or "the National City Lines conspiracy" (Wikipedia.org). Between 1936 and 1955 the number of electric streetcar lines had dropped from around 40000 to 5000 in the US as a result. GM also used it's nearly monopolistic control over the bus and locomotive market to make sure that public transportation kept loosing ground to private motoring. And so with devastating effects for the environment, but also in a technology sense, USA today have to rely on private motoring for 90% of all ground transportation of goods and people, which is more than any other country in the world. One can't defend these actions by claiming they did not know about the effects. Bradford Snell, a U.S. government attorney, once stated in a famous report to a US Senate committee that: "motor vehicle travel is possibly the most inefficient method of transportation devised by modern man" (Foster, 1999: 114-116, 124). John Bellamy Foster argues that capitalism has had "overwhelmingly negative results" for our planet (Foster, 1999: 32). For example, the commercial trade, i.e. capitalism, in fur has led to the destruction of entire ecosystem and an enormous and never before seen slaughter of wildlife. Some of the animals worst affected by the fur-trade during the 16th and 17th century was beavers, martens, seals, bears, raccoons etc. Between 1797 and 1803 on the island of Mas Afuera in the Juan Fernandez Islands, off the coast off Chile, over 3 million seals were killed for their fur. In the early 19th century six million southern fur seals were clubbed to death resulting in the nearly extinction of fur seals in the Atlantic and Indian Ocean (Foster, 1999: 42-43). Capitalism doesn't just result in environmental destruction and resource depletion but it also divides people. A fine example of this is the memorandum from Lawrence Summers. On December 12, 1991, Lawrence Summers, the chief economist for the World Bank, wrote an internal memo that was leaked to the British publication the Economist on February 8, 1992. In it he says that the World Bank should be "encouraging MORE migration of the dirty industries to the LDCs [Less Developed Countries]", and that "the economic logic behind dumping a load of toxic waste in the lowest wage country is impeccable". He also writes that "the demand for a clean environment for aesthetic and health reasons is likely to have very high income elasticity" (quoted in Foster, 2002: 60-61). In fewer words: Summers says that people in the Third World are worth less than people in the North, and thus they could be exploited more by the capitalistic world system. But it's not just in the Third World that capitalism takes the form as environmental racism. In Los Angeles over 70% of African Americans and 50% of Latinos live in areas with the highest amount of air pollution. This can be compared to the 34% of white people living in the same areas (Foster, 1999: 138). Karl Marx came up with the term "metabolic rift" to explain the rift capitalism have created between social systems and natural systems. This rift, he claimed, led to ecological crisis and the exploitation of the environment. As people moved into cities they lost the contact with nature, and thus they became less likely to consider what the best for the environment was, and how their actions and decisions affected it (McMichael, 2008: 11 and Foster, 1999: 63-64). Marx also noted that as the income for the workers in the cities increased companies (capitalists) searched for cheaper workers outside of the city (Moore, 2000: 136-137). Today when half of the world's people live in cities this is happening on a much larger and more global scale. More people than ever have lost the direct contact with nature (Satterthwaite, in the Guardian 2007). And instead of companies and corporations looking for cheaper workers in the countryside they now look outside the nation's borders, mainly in Third World countries. When it comes to climate change McMichael says that the "only sound solution" is by basically reformulating the generally accepted perspective of development. But he warns that resistance, for what science says needs to be done to tackle the climate crisis, will come from "corporate interests", "politicians with short-time horizons" but also from strong talks "of neo-liberalism that represents market solutions as commonsense" (McMichael, 2008: 14). He concludes that the "de-carbonization of the material economy will require substantial de-commodification to establish sustainable development, which in turn means the development subject would no longer be the high-mass consumer, but a politically-mobilized social and ecological steward". And that this time the goal for the "North" is not just to supply and "secure" its home markets with valuable raw materials and other commodities. Now it's also about supplying the Third World with "environmental repair or caretaker services" to be able to lessen the damages and problems that the system itself has created (McMichael, 2008: 16-17). Immanuel Wallerstein says that he is "relentlessly pessimistic" on how sustainable development could be possible under capitalism (Hornborg, 2007: 22-23). He also says that we are "in the middle of a transition" away from capitalism to something else. But what that is and if it will be better or worse he do not know. "The outcome will be decided by the political activity of everyone now and in the next twenty-five to fifty years", he writes (Wallerstein, 2007: 384-385). Hopefully. Another world is possible. Ponting, Clive (1991). "Creating the Third World," in A Green History of the World. New York: St. Martin's Press, 194-223. McMichael, Philip (forthcoming 2009). "Contemporary Contradictions of the Global Development Project: Geopolitics, Global Ecology and the "˜Development Climate," Third World Quarterly. Wallerstein, Immanuel (2007), "The Ecology and the Economy: What Is Rational?" Foster, Bellamy, John (1999). "The Vulnerable Planet"
Foster, Bellamy, John (2002) "Ecology Against Capitalism"
Gore, Al (2007), "The Assault on Reason"
Lovelock, James (2006), "The Revenge of Gaia"
....As regards the fall of the Roman Empire, there is a Tabloid version of history here along the lines of "Rome ended because the Vandals....Vandalised Rome in 460....bloody foreigners!" The truth is a little different. Rome was sacked several times and the Empire hung on for sometime beyond the final sacking, although arguably it had passed the point of no return centuries earlier. The collapse of the Roman Empire was thus a more gradual affair in which a host of social, politcal and environmental factors played a role, Vandalising Vandals were just the final straw that broke the camels back. As Jared Diamond put it (I'm paraphrasing here as I don't remember the exact quote) "the collapse of any advanced civilisation can be characterised as a series of entirely rational short term decisions, which proved to be ultimately irrational over an extended period" There is a desperate need for people today to realise that our civilisation is not immune to the same mechanisims of collapse. Least we forget, the soviet Empire collapsed just 20 years ago.